Why is it different? 100% Moderation: Every post and reply is checked before it reaches the app to eliminate all bullying, judgment or humiliation. Positive feedback and support is curated into the app. Why Peer Support? 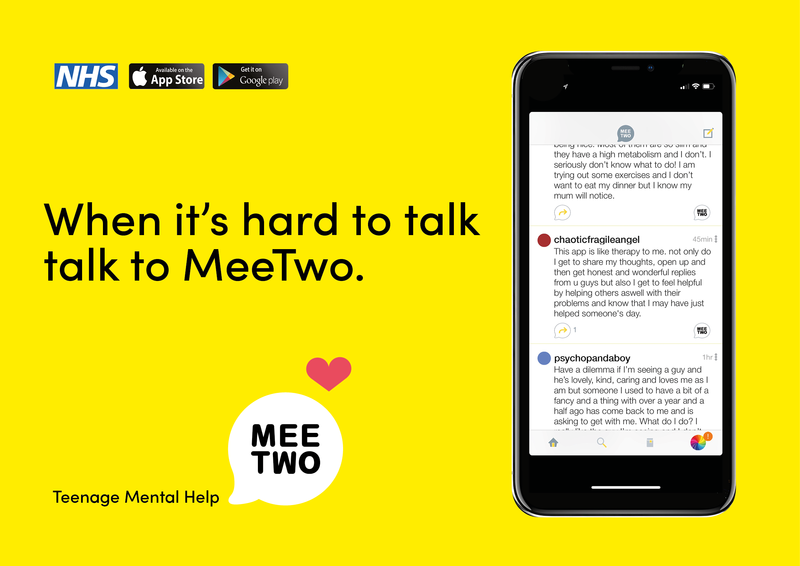 MeeTwo builds on the empirical success (1) of the peer support model – where young people help each other – by creating a free, standardized, and scalable solution that is accessible to the 84% (2) of UK teenagers who have a smartphone. Are there any adults involved? MeeTwo is curated by qualified psychologists. Within the app, trained ‘super peers’ who are actually undergraduate psychology students guide advice chains and ensure everyone gets supported. They also provide the kind of advice that other users model their responses on. Is it educational? Yes. Educational resources are developed in response to users needs, so if there is discussion around a specific topic, relevant advice and information is integrated into the app. Is it creative? yes. MeeTwo encourages young people to express themselves visually as well as verbally. Getting their work published gives users a sense of achievement and their creative input stops the app looking and feeling feeling like a worthy “mental health” resource. Can users access real world support? Yes. MeeTwo has an inbuilt directory of specialist support groups, so users can call helplines or explore the websites of National charities such as Childline, Young Minds or Brook through a closed loop system. Being able to do this privately allows them to explore support without feeling stigmatised. Is it safe? MeeTwo is safe because we have a sophisticated back end safeguarding system which ensure that vulnerable children or risky posts are picked up before they hit the app. These young people are directed to more appropriate support. What happens if a post is rejected? When posts are rejected young people are given a clear explanation as to why their post failed so that they can learn from their mistakes. What does it achieve? MeeTwo improves emotional articulacy by encouraging young people to identify and express their feelings. Positive feedback, advice and social support builds confidence, increases wellbeing and promotes emotional resilience (3). MeeTwo allows young people to access advice support without labelling themselves as having a problem. It is a neutral space which lets young people to experiment with what it feels like to open up without drawing attention to themselves. MeeTwo offers active support, practical advice and tools for change. Its important because improved emotional wellbeing benefits all teenagers psychologically, socially and educationally.